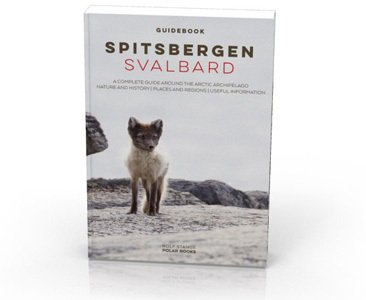 General: Situated just under 80°N at the northeastern corner of Spitsbergen at the entrance to the Hinlopen Strait, Sorgfjord is a scenic little fjord with a lot of interesting history. In earlier years, Sorgfjord was also called ‘Treurenburg Bai’. Geology: Upper Precambrian, non-metamorphic sediments such as quarzites and dolomites, tectonically deformed and mostly steeply dipping. 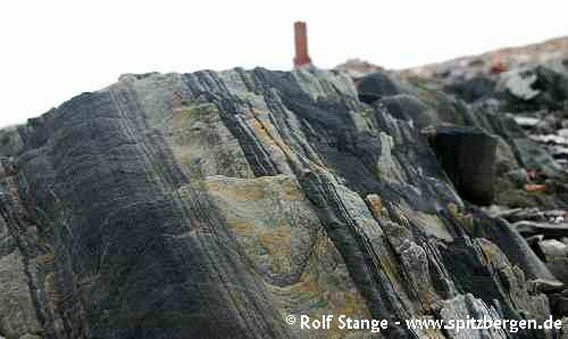 The same rocks are found further south in the Lomfjord, in the northeastern Hinlopen Strait and on Lågøya. The mountain Heclahuken east of Sorgfjord. Steeply dipping upper Precambrian sediments (light-grey quarzitic sandstone and dark silt- and claystone) on the eastern side of the Sorgfjord (Crozierpynten). Landscape: Low plateau-shaped mountains with wide coastal plains, on which there are well-developed series of beach ridges. The interiour south of Sorgfjord is strongly glaciated. Sorgfjord is a beautiful area for hiking. The northern part of Magdalenafjellet can be reached relatively easily with a bit of stamina and sure-footedness. View over the inner Sorgfjord. Flora and Fauna: Quite barren, not an outstanding wildlife site. Occasionally reindeer, and the mountains are, as can be expected, good places to find ptarmigan. The frequency of walrus sightings has increased in recent years, a very positive sign of the comeback of this species after it had been hunted almost to regional extinction until the 1950s. History: Varied. 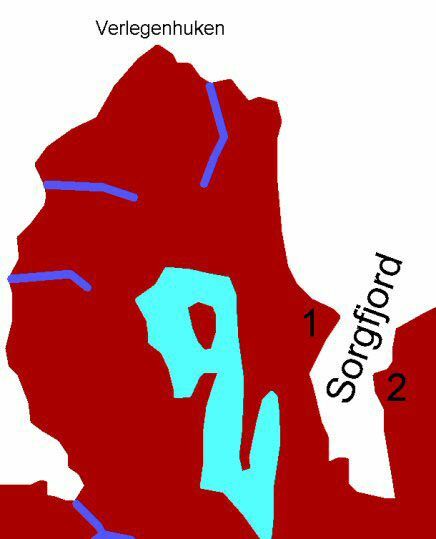 The name ‘Sorgfjord’ (Worry fjord) goes back to the whalers and may refer to difficulties with the ice in this corner of Spitsbergen, where the Gulf Stream is loosing its influence. It could also refer to armed conflicts between different whaling nations: In 1693, the Sorgfjord saw the northernmost sea battle ever when thee French warships brought up 40 Dutch whaling ships. 13 Dutch ships were captured, the rest escaped. A little graveyard at Eolusneset on the western side of Sorgfjord reminds us of the dangers of a whaler’s life. It was used by whalers in the 17th and 18th centuries, certainly including Dutch whalers, possibly also from other countries. In 1827, the Englishman William Edward Parry anchored on the east side of Sorgfjord with his ship Hecla. The bay, located directly south of Crozierpynten, has since been known as Heclahamna (Hecla harbor). The hill Flaggstanghaugen on Crozierpynten is just 31 meters high. Sometimes this is more than enough for a great view. Heclahamna is on the southern side of Crozierpynten. Parry tried to reach the north pole with specially constructed sledge boats that could both be rowed in open water and pulled over ice, but he had to turn around at 82°40’N due to the difficulties the ice provided and the current which was against him and his men. The discovery of this NW-SE going current was, at least, a very significant one. 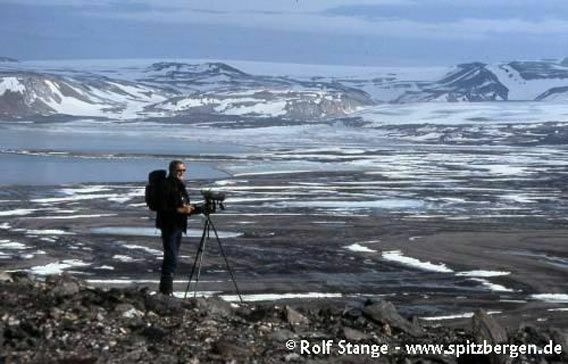 As a consequence, Spitsbergen was mostly ignored by following expeditions aiming for the north pole, who favoured arctic Canada and northern Greenland instead for their bases. The cross to which the little peninsula Eolusneset owes its name. It was erected on June 06, 1855, by skipper J. Holmgren, Captain of the schooner Æolus from Bergen. The ship was trapped in ice for some weeks, and then it is of course always good to build a cross – you never know. In 1861, Æolus was there again, with the famous Swedish scientist Otto Torell on board. The Swedish-Russian Arc-de-Meridian Expedition (1899-1904) used the eastern side of the Sorgfjord (Heclahamna/Crozierpynten) for one of their headquarters. Remains of the buildings of the Arc-de-Meridian-expedition at Crozierpynten. The list of those who visited Crozierpynten in the 19th and early 20th century is almost a who-is-who of arctic exploration of those years … the above-mentioned Edward Parry (1827), the Swedish section of the Russian-Swedish Arc-de-meridian-expedition established their wintering quarters there in 1899, and the Herzog Ernst, ship of the Schröder-Stranz-expedition, was forced to spend the winter 1912-13 there, while the leader himself, Herbert Schröder-Stranz, was most likely already dead on Nordaustland. This list is anything but complete. Not to mention all the trappers who wintered there when the Swedish house was still standing upright. The station of the Arc-de-Meridian expedition on the southern side of Crozierpynten was built in 1899 by the Swedish section of the above-mentioned expedition and subsequently used to winter there. The expedition is surprisingly little known, but it was very successful and brought a wealth of topographic and other scientific material back home without any loss of life, quite in contrast to many others in those early years. Later, Sorgfjord was the pivotal point for the ill-fated Schröder-Stranz-Expedition. Trappers did not winter too frequently in Sorgfjord. They preferred Wijdefjord, the neighbouring fjord further west, which was easier to reach and provided better hunting opportunities. It was easier to get home again early in the summer after a wintering from Wijdefjord than from Sorgfjord, where the drift ice would often block the passage around Verlegenhuken from quite some time into the summer. There is still the ruin of a trapper hut on the north side of Eolusneset, but it has never been more than a small, secondary hut used occasionally on hunting trips from the main territory further west, in northern Wijdefjord.